While having your Bimini top up is essential in 95% of the cases (aka hot sunny days out on the water), there are a couple of situations when it might be better to keep it collapsed. The most common three situations are when towing your pontoon, when not in use, and during lightning. Today, we’re gonna tackle these three situations and what would be best to do during each of them. What to do with Bimini top when towing your pontoon? I personally prefer to collapse the Bimini top during trailing and towing, and so do most of my pontoon buddies. Why? For one, because I’m afraid the extra height could catch on anything from tree branches to gas station forecourts. Two, the boat and the railing on it are not accustomed to traveling at such high speed – I’ll hardly ever go past 30mph on water, but I sure am driving at 60mph with the boat in tow when going back home. That puts unnecessary pressure on the railing, and it also creates creaking and squeaking noises, which made me really anxious (that one time when I actually followed a buddy’s advice and didn’t collapse the Bimini before towing it.) On top of all that, I feel like the extra height makes the boat more unstable on the road, and the wind resistance could cause the fabric cover to tear, especially where it connects to the metal railing. What to do with Bimini top during lightning? This is a bit of a trick question for me since I have never been caught in a lightning storm while on water, but much like any other boater, I have wondered what would be the best thing to do in that case. Well turns out that, as far as Bimini tops go, there’s really not much difference between keeping them up or down during lightning. Yes, they are metal objects, and elementary school science taught us that metal objects are more likely to be struck by lightning and should be taken out of the storm’s way, or places as close to the ground to the possible to avoid it. However, according to certain boating forums, Bimini tops are not tall enough to be considered a threat during lighting. keeping it up or collapsing it would make little to no difference, and you should probably focus your attention on getting your boat out of the storm’s way first. 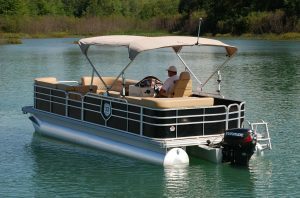 What to do with Bimini top when not using your pontoon? This one is pretty self-explanatory – if you’re keeping it in the marina, don’t bother collapsing it. If you keep it in your backyard or driveway, again, I wouldn’t bother collapsing it. But if you’re like me and you keep your boat in the garage, you might need to collapse the Bimini top depending on the height of your garage doors. First of all thank you for always sharing your thoughts with you, I’m always coming back to your blog for pontoon ideas and advice. Just wanted to share my own point of view here, I’ve actually been caught in a rather big storm this summer while out on the river. Stuff got scary real fast when lightning started striking to be honest. I didn’t touch my Bimini as that was kind of the last thing on my mind at the time and would recommend everyone to do the same and just focus on getting the boat out of the storm’s way.